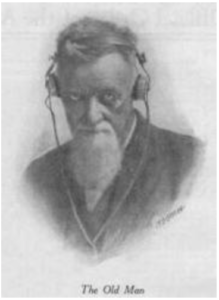 Beginning in 1917, stories by an anonymous writer using the pseudonym “The Old Man”, or “T.O.M.” began to appear in the American Radio Relay League’s (ARRL) monthly publication QST. Titled the “Rotten Radio” series, they harshly assailed and exposed the poor operating practices of the day with caustic satire and humor. It was in one of these stories, entitled “Rotten QRM”, that T.O.M. blasted the gibberish he’d overheard in one particular QSO, citing as an example the words “wouff hong”, which apparently was either a concocted abbreviation, or someone’s poor attempt at sending. I have more about my own Wouff Hong at this link. In today’s politically correct world, T.O.M.’s writing, taken on its face value, seems quite sharp. However, when taken in context with the times, it was arguably well written, interlaced with hyperbole and sublime humor. It is my feeling that T.O.M. wrote not so much to offend the sloppy operators, but in an attempt to correct and show them how poor their sending really was. Remember at this time, many of the conventions and procedural signs we take for granted when operating CW had not yet been worked out. T.O.M. was also justify concerned with government intervention of the early amateur privileges, and felt that poor or sloppy operation and procedure only gave weight to the early critics of amateur radio. More about this formative period can be read in Clinton B. Desoto’s excellent work, “200 Meters and Down”, first published in 1936. In later years, the series continued, with the focus somewhat shifted from poor amateur practice, to other concerns of the early radio amateur. In 1919 that T.O.M. contributed an article to QST called “Rotten Starting”, criticizing the slow progress of the United States government in allowing hams to operate again after World War I. At the time of these articles T.O.M. did not know what a Wouff-Hong was, but he later adopted it as a disciplinary object with which to both flail bad operating practices and inflict punishment on the perpetrators. It is said that in the following era he had, tongue in cheek, proposed its use as an instrument of torture and discipline, to maintain decency and order in the ham radio community. T.O.M.’s 1919 letter, “Rotten Staring”, finished with “I am sending you a specimen of a real live Wouff-Hong which came to light when we started to get our junk out of cold storage. Keep it in the editorial sanctum where you can lay your hands on it quickly in an emergency. We will soon be allowed to transmit, and then you will need it.” Accompanying this article was a misshapen, wooden, wire-bound two-pronged tuning fork-like object. Yes, the Wouff-Hong. It was in the July 1919 issue of QST that the portrait of the Wouff-Hong first appeared. At each meeting of the League’s Board, the Wouff-Hong stood on display, to the humbled looks of the Directors. We can thank Maxim for amateur radios two great instruments of discipline, the “Wouff Hong”, which we mentioned earlier, and later, in 1921, another implement of correction, called the “Rettysnitch”. I’ve posted images of both items below. The “Rotten series” as it has come to be called, did not go without answer by those it took to task in the radio community. It seems that some of the very folks that Maxim took to the woodshed wrote back to QST in reply. I’ve included one of the more humorous replies, from the “Young Squirt” here, on the menu to the left. Only after his death, was it was revealed to all that T.O.M. had actually been Hiram Percy Maxim, the founder and first President of the ARRL. I’ve taken the liberty to write my own “Rotten Radio” letter, using the style and form of Maxim, updated with what I view to be today’s blight upon our amateur band, poor amateur practices in digital operating. You’ll find it under the “Rotten Digital Mode“.